Does Workout Order Matter for Triathletes? 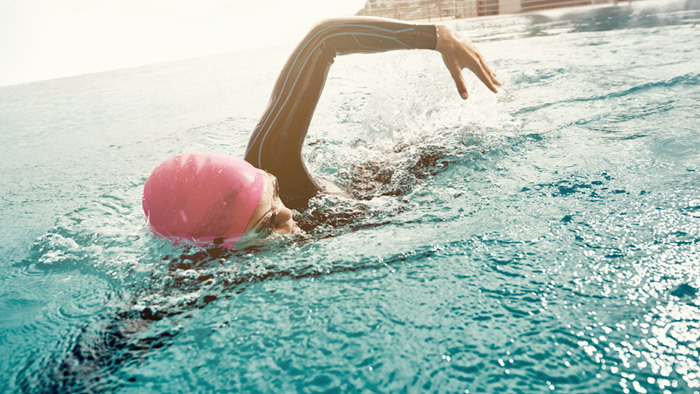 Training for a triathlon can be a scheduling challenge for the typical age grouper. If we want to fit in three swim sessions, three or four bike sessions, and three run sessions, and have a day off of training in a week, there is no way around having multiple training sessions in a day. This begs the question – does it matter what order in which you do them? To answer this, let’s look at a few things that we should consider when putting together a training plan. Training with specificity means that you are simulating what you will be doing in your race. It doesn’t mean swim, ride, or run race-pace every workout, but it does mean that you will make the most gains in your bike fitness by riding your bike. In terms of preparing your body to know what a triathlon feels like, it would mean that whenever possible you’d want to swim first, then bike, then run. Your race preparation/brick workouts should be in race order so you know what it feels like to hop on the bike after swimming, and run when you get off the bike. Though you can have fun with multiple bricks like swim-bike-swim-bike or bike-run-bike-run-bike-run. But keeping the swim-bike-run order isn’t always necessary for your training when you have your workouts spread throughout the day. This is because we need to consider quality sessions and recovery. What time of day are you most fresh to perform your best? You would ideally put your quality workout for that day at a time when you are going to have the best chance of nailing that workout. This might be at different times of the day for different individuals. Often afternoon workouts, after you’ve been able to fuel with good meals during the day, allow you to have better performance. As an example, if you have a bike interval workout and an easy drill session in the pool scheduled on the same day, it might make sense to do the bike workout over your lunch break, since you’ve had some time to fuel up with breakfast and a mid-morning snack, and then later in the day hop in the pool for the drills and that workout may also serve as active recovery. In that case it doesn’t matter in the big picture if you don’t work out in the same order as you race, as there are gaps of recovery between each workout, and your focus for that day was getting in a good bike session. Most training schedules will only have one quality workout a day, so you should try when possible to plan around that one. Your daily schedule is another component in deciding how to order your workouts. Most of us have other things going on in our lives beyond swim, bike, and run, so we need to put our triathlon training at times that doesn’t interfere with those things. That often means early morning and evening workouts. It could be that we have to do a quality session first thing in the morning because that’s when it’s easiest to get to the pool, when we’d actually prefer to do it in the afternoon or after work. But getting in the workout to keep the consistency of training, even if it’s not the ideal time of day, is better than inconsistent training. The bottom line is you want to arrange your schedule so you have the most energy for your quality sessions and those should be the priority workouts on those days. Your goal in training is probably to improve each sport as much as you can, which means being as rested as possible for quality sessions, and put them at a time that you will most likely get it done. If there are significant gaps between training sessions, the order becomes less relevant due to the recovery between sessions. For race specificity in brick workouts you will want to maintain the swim-bike-run order. Triathlon training should be an enjoyable part of a healthy lifestyle, not a logistical nightmare!